With its stock in the dumps and its CEO in the hot seat, Snap is going to the dogs. 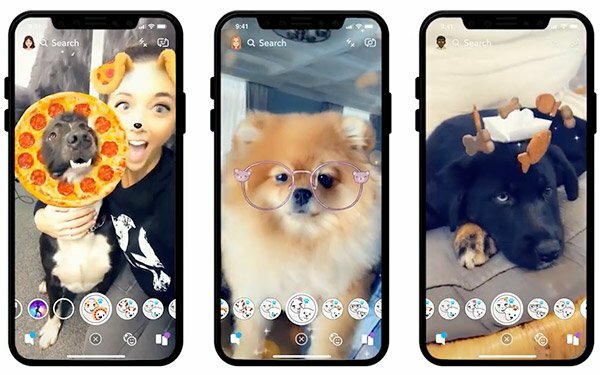 The struggling social network is adding augmented reality “lenses” for users’ four-legged friends. The lenses include ornament-adorned reindeer antlers (for dogs), a blue butterfly that rests on a dog’s nose, oversized wire-rimmed eyeglasses (for dogs), super-chunky coke-bottle glasses (for dogs), and, of course, a pepperoni pizza that wraps around a dog's face. Positioning the effort partly as a philanthropic endeavor, Snap launched the new lenses in partnership with Wags & Walks, a Los Angeles-bases animal advocacy and rights group. Charity aside, Snap is hoping the new lenses can provide its service with a much-needed boost. Yet, the growth isn’t satisfying investors and analysts, many seem to believe that Snap’s best days are behind it. Once valued at more than $30 billion, the company’s market cap recently sunk below $7 billion, while analysts worry the worst is yet to come. Current and former Snap employers are increasingly pointing the finger at founder-CEO Even Spiegel, recently detailed by The Wall Street Journal. Among other missteps, Spiegel is being blamed for over investing in Spectacles -- Snap’s video-capturing sunglasses. A billion cute dog pics aren’t going to solve Snap’s underlining management problems. However, Spiegel continues experiments with new revenue-generating features. Perhaps the most ambitious play involves Amazon and what Snap hopes is its own burgeoning commerce strategy. The partners recently started testing a visual product search feature, which lets users search for products simply by snapping their photo -- or their barcode -- with a smartphone. 1 comment about "Snapchat Offers Augmented Reality Filters For Dogs". Sapphire ringsCo from SapphireringsCo, December 27, 2018 at 10:22 a.m.